Although Hungary is not known for producing great figure skaters -- no Hungarian men's or ladies' singles skater has ever won an Olympic medal -- Julia Sebestyen has established herself as one of the best skaters from talent-laden Europe. She placed sixth the European Championships in 1999, 2000 and 2001. 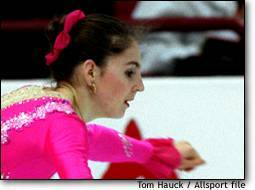 At the 1999 European Championships, she placed second behind Russia's Maria Butyrskaya in the long program. Unfortunately for Sebestyen, poor performances in the qualifying round and the short program meant kept her from finishing higher. Sebestyen placed third in the free skate at the 2001 European Championships in Bratislava, Slovakia. She had her best finish at the World Championships during the 2000 worlds in Nice, France, where she placed seventh. Sebestyen dropped to 18th at the 2001 worlds after a fire at her ice rink in Budapest disrupted her preparation. That result, coupled with teammate Tamara Dorofejev's 19th-place finish, means Hungary will have only one ladies' berth at the 2002 Salt Lake City Games. Sebestyen has finished second at the Hungarian national championships three years in a row (1999-2001) and also in 1995. She made her Olympic debut in 1998, placing 15th in Nagano as a 16-year-old. Perhaps the biggest improvement in Sebestyen's skating of late has been in her artistry. Sebestyen had Nina Petrenko, the wife of 1992 Olympic men's champion Viktor Petrenko, choreograph her Olympic-year short and long programs, and the result is a much more artistic look on the ice. "People say it's a huge difference," Sebestyen says. She selected her own music - Rodrigo's "Adadgio" for the short and "The Man in the Iron Mask" soundtrack for the long. Unlike the vast majority of the world's elite skaters, who took figure skating lessons at indoor facilities from an early age, Sebestyen developed her talents at an outdoor rink where temperatures were often almost unbearably cold. She started skating at age 4 at an open-air ice rink in her hometown of Tiszaujvarosi and continued to train there until she was 13. After placing 21st at the 1995 World Junior Championships, she moved to Budapest. Sebestyen lived with Klara Kozari, who was the president of the Hungarian Figure Skating Association at the time. Sebestyen says that Kozari is "like a third grandmother to me." Sebestyen now has a flat of her own in Budapest. She is coached by Andras Szaraz, an eight-time men's national champion for Hungary who ended his competitive career in 1990. Around Christmas 2000, the Budapest Sport Centre, which housed the rink where Sebestyen trained, burned down. Officials said the cause of the fire was probably some candles that were left burning at a nearby Christmas market. The fire severely impeded Sebestyen's skating, as there are only two other indoor rinks in Hungary. She trained in Simsbury, Connecticut, for a week before the 2001 World Championships, but she still arrived in Vancouver poorly prepared. Since the fire, she has done some training in Sweden and some in Connecticut. When in Budapest, she trains at a huge open rink in a park in the center of the city. Sebestyen trains on a part of the ice that is covered by a bubble, but she says it's still extremely cold. Sebestyen started skating at age 4 on an open-air ice rink in Tiszaujvaros. She continued to train there until the age of 13 when she moved to Budapest after competing in the World Junior Championships. Coach Andras Szaraz was a National Champion and competed internationally for Hungary.In 2004 Sebestyen won the first European Ladies title for Hungary in history. International Skating Union, Chemin de Primerose 2, CH - 1007 Lausanne 11.03.2010.